Alphonse Steines' cunning plan to take riders over the Pyrenees for the next edition of the Tour de France was met with dismay. "You're going crazy!!" was the response from race director, Henri Desgrange. "But this is the injection we need if we want more interest from the public. We have taken the riders over the Ballon d'Alsace. We need something more. Let's try the high mountains!" Argued the innovative sports journalist from Luxembourg. Desgrange agreed to his assistant going out and investigating a route. So in January 1910 Alphonse Steines set off in a hired chauffeur driven car from the village of St Marie de Campan, to climb up the 17km to the col du Tourmalet. Everything was going ok as the car crawled up the road. Suddenly at 4km from the top, and as the night was closing in, a snowstorm struck, rendering the road impassable. Despite Steines' determination to continue, his chauffeur refused any attempt to drive on. The ever persistent Steines got out of the car and continued his ascent on foot in the darkness. Neither the bitterly cold snow nor the threat of bears in the wilderness were going to deter him. When Steines had not returned at the end of the evening a search party was sent out. He was found at around 3am shivering, tired and in shock near the village of Barèges. The innkeepers took him in for the night where he was offered a meal and a hot bath. "Crossed the Tourmalet. Very good road. Perfectly practical. Steines"
When the route was presented to the bike racers in April 1910, a number of them recce'd this new Pyrenean inclusion. Alarmed by what they found, many of them didn't bother to start the race. "We'll never be able to get up there" they said. On July 3rd only 110 riders actually showed up on the start line, compared with the usual 150. 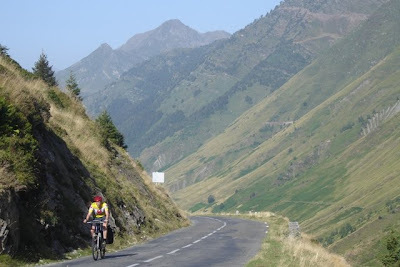 People simply didn't feel it would be possible or even safe to ride up all these Pyrenean climbs. 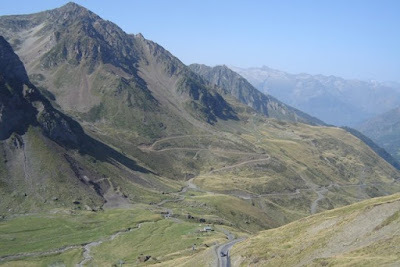 As he "raced" up the Tourmalet on 21st July that year, Octave Lapize, one of the best climbers of the day was reduced to walking up this giant of the Pyrenees. "You are murderers, yes murderers!" he shouted, later on as he passed the organisers. At the bottom of the col d'Aubisque Lapize vowed he would quit the race once he reached the nearby village of Eaux-Bonnes. Having been persuaded to continue, he won the Tour de France that year, ahead of only 40 other survivors of the gruelling competition. Last Thursday when Christian Prudhomme unveiled the route of the 2010 Tour de France, many of the racers were excited at the tantalizing challenge of scaling the col du Tourmalet twice. 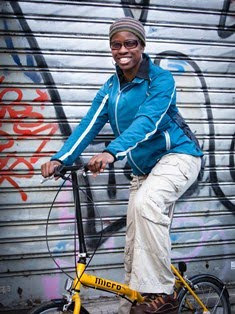 Professional teams will be doing their utmost so they can qualify to compete in the world's biggest bike race. Amateur bike riders will be flooding the Etape du Tour lottery system or paying over-inflated prices so that they can ride stage 17 and pedal up the Tourmalet. It's quite ironic how back then, in 1910 riders shunned and cursed the idea of cycling up the col du Tourmalet. A century later cyclists the world over, can't keep themselves away from it! And just think, if it hadn't been for Alphonse Steines' "white lie", today we may just be contenting ourselves with a spin over the Ballon d'Alsace!